Live Love Polish is an online shop which stocks the most popular and amazing brands in the nail industry. They sent me this collection as a gift which was so sweet of them. This collection consists of 3 crellies glitters 1 jelly glitter bomb and 1 thermal polish. This collection reminds me of the delicious donut frosting that brings water in my mouth LOL. The formula in these polishes was amazing despite the fact that these are crellies fully loaded with different type and sizes of glitters. The brush is medium sized one which is good for crellies. Donut Ever Let Me Go - A beautiful baby pink crelly with multicolored bar glitters in it. I spotted white, green, red and blue glitters. Glitters were hard to get on the nail in the first coat, but it came out really well in the upcoming coats. This polish does stain and that too badly so you better use a base coat. Shown here is 3 coats with Topcoat. Cookie Monster - A lovely light cookie brown crelly with dark brown medium hex glitters and copperish tiny hex glitters. Glitters spread on the nail so nicely that I was amazed to see a crelly glitter so perfect. Shown here is 2 thin coats with Topcoat. Mint Chocolate Ice Cream - A delicious looking mint crelly with dark brown tiny and medium hex glitters in it. again the glitters spread really well. This is absolutely my most favorite one from this collection. Shown here is 2 thin coats with Topcoat. Double, Double, Toil & Truffle - A pretty brown jelly with tiny and medium gold hex glitters in it. Glitters spread amazingly on the nail, covering perfectly every bald spot if seen. Shown here is 3 coats with Topcoat. Latte For Work Again - A lovely light beige thermal polish. Because of long transit, the polish somewhat lost its thermal properties so I am showing you its permanent color here. This one dries satin so a top coat is required for the glossy look. Shown here is 3 coats with Topcoat. Overall, I loved the entire collection, they are pure perfection in regard to formula, colors, brush, and, of course, the delicious finish. 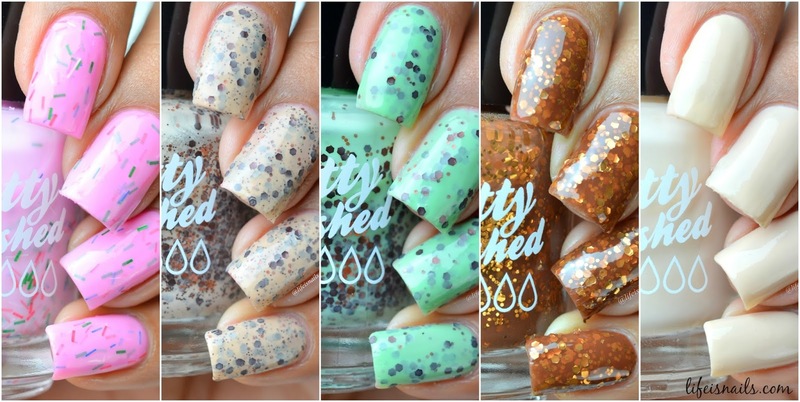 You can get this entire collection exclusively at Live Love Polish Store. Few colors might be out of stock, but they will be stocked pretty soon.